Same day courier specialising in the carriage of urgent, sensitive and confidential goods and documentation. Our courier staff are highly qualified advanced drivers with experience of handling sensitive and confidential items including those bearing the Government Protective Marking Scheme. The fully equiped courier bike has a hard luggage system to protect your goods and the riders blue tooth technology allows progress to be tracked. 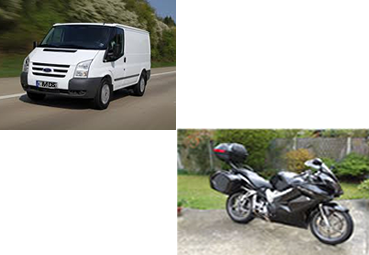 Our motorcycle and light courier service offers same day collection and delivery of goods, including data discs, drawings, plans, documents and time sensitive packages to nationwide locations. We can also offer the prompt collection and delivery of overlooked travel documents to you at the airport.